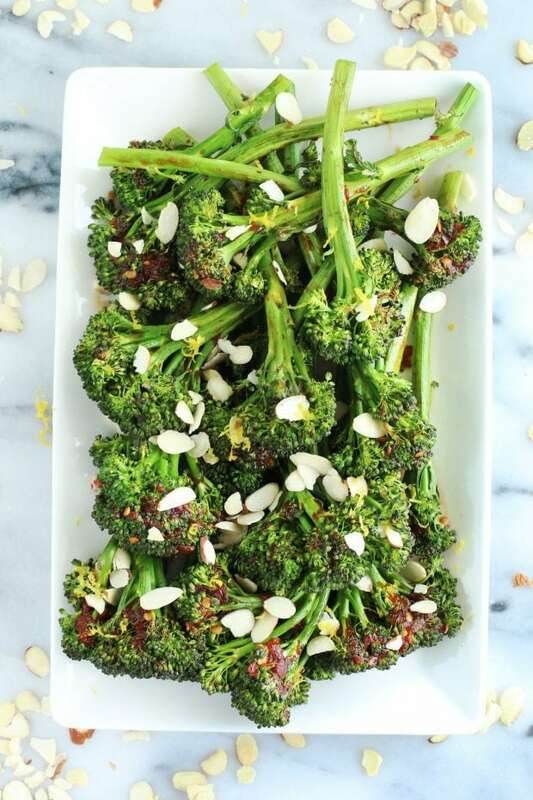 Spicy-Sweet Roasted Broccolini is a delightful blend of sweet, spicy, and fresh that goes with pretty much any entree you can think of. 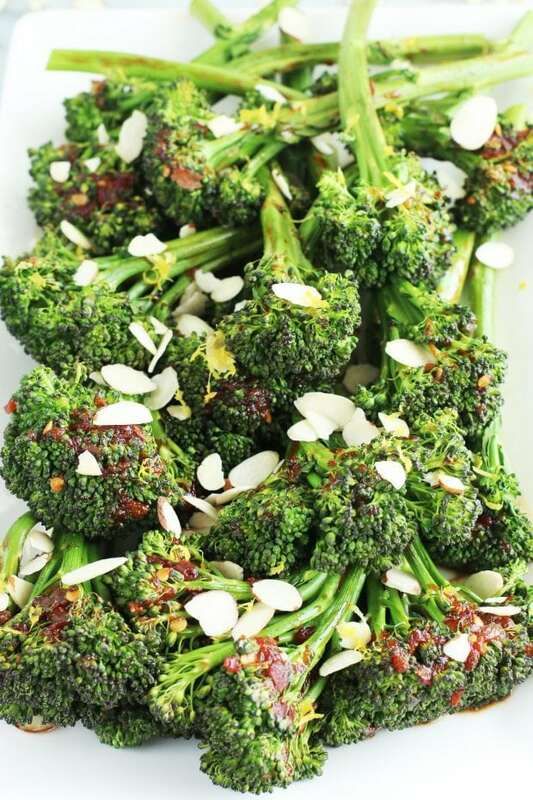 The spicy sweet sauce is full of flavor and really complements the crisp tender roasted broccolini. 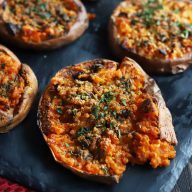 Plus, it’s so easy to throw together, you don’t have to worry about your side dish taking away your full attention as you cook. Spring has sprung, and even if the weather here is being bipolar with snow/rain/sun on repeat, I am diving face first into all the fresh spring vegetables! 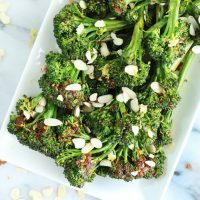 Broccolini is one of my favorite vegetables to roast during the spring. I love how green it stays, even when you roast it, unlike broccoli that tends to brown too quickly in the oven. Plus the crisp tender crunch and fresh flavor are just a burst of change from all those heavy winter seasonal vegetables you’ve been eating for months. Now as much as I can sing an ode to broccolini, it’s the spicy sweet glaze on this broccolini that really puts it over the top as an amazing side dish. 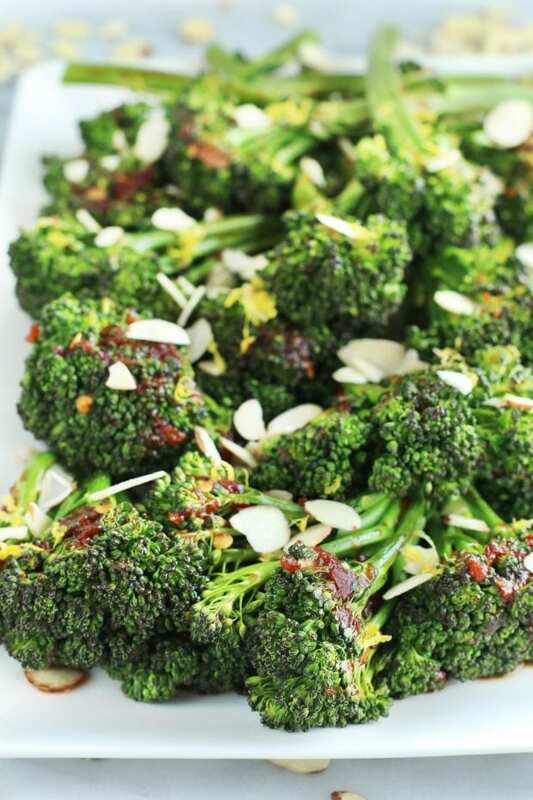 The glaze is a little sweet, a little spicy and perfectly balanced to bring out the incredible flavor of the broccolini. Once you taste this side dish, you are doing to want to take a bath in the glaze. Seriously, it’s just the right amount of sweet and spicy that is so often so hard to achieve! No matter what you are serving up for your entree, I can assure you that this side dish will go absolutely wonderfully with it. I personally love pairing it with chicken or fish, but steak or any vegan entree are great options as well! Love roasted vegetables? 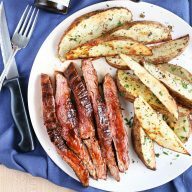 Check out some of my favorite recipes below! If you need some spring inspiration for dessert, be sure to check out my Lemon Rosemary Meringue Tart! Pin this Spicy-Sweet Roasted Broccolini recipe for later! 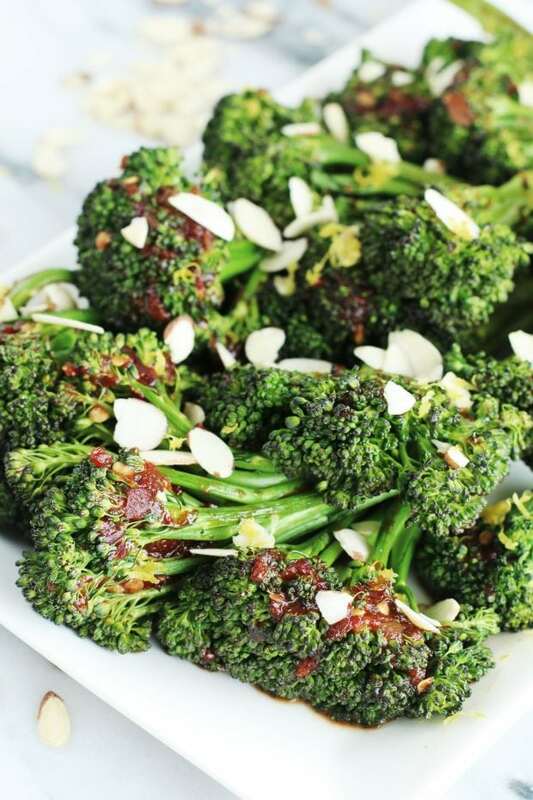 The spicy sweet glaze on this crisp tender broccolini makes it an ideal side for steak, chicken, fish and so much more! Place broccolini stems on a large rimmed baking sheet lined with parchment paper and silicone mat. Season well with salt and pepper. Roast broccolini in the oven for 10-15 minutes. 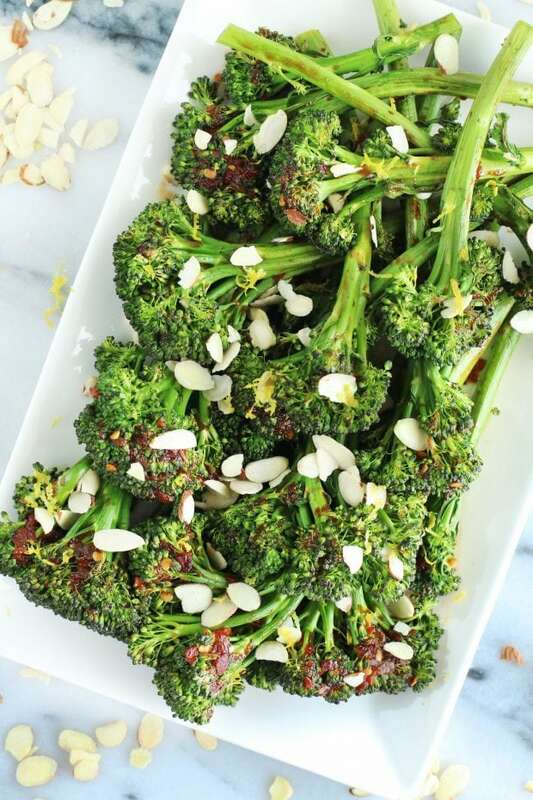 While the broccolini is cooking, combine hoisin sauce, chili garlic sauce, honey, lemon juice and vegetable stock in a small bowl. Stir until well combined. Remove broccolini from oven. Pour the glaze over the broccolini. Place on serving plate and sprinkle with sliced almond. This is a great side dish. I LOVE the flavors that roasting brings out in veggies. Can’t wait to try this! I love a sweet and spicy combination! Such a delicious side! I’m so glad it’s spring and the weather is starting to act like it too! This looks like the perfect dish to welcome it in! Broccolini is such a fun veggie! And I love the sweet and spicy combination. 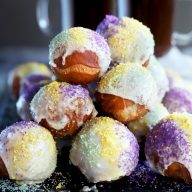 Definitely going to have to add this to our menu! Wow this broccoli looks so tasty! This is such a great way to eat broccoli! Such a great way to enjoy broccoli! I love Broccolini. I wish my local grocery carried it more often. Saving this for when I see it next.